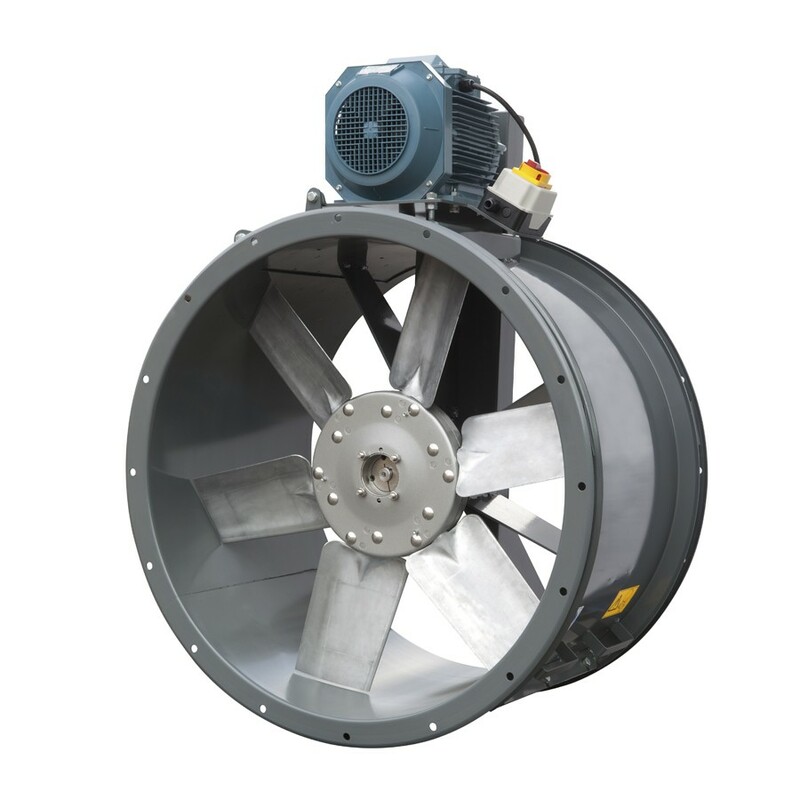 Range of cylindrical cased axial flow fans with motor located externally to the fan casing and incorporating a belt driven impeller making this range suitable for continuous operation up to 120�C. The casings are manufactured from high grade rolled sheet steel protected against corrosion by cataforesis primer and black polyester paint finish. The drive system consists of an industrial poly V-belt drive pulley system which is enclosed within metal protective guard. All models incorporate diecast aluminium impellers available with 2 or 3 fixed blade angles. The impellers are finished in red colour epoxypolyester paint coating. All the motors are IP55 class F, fitted with ball bearings greased for life. Three phase 230/400V-50Hz or 400V-50Hz (See characteristics chart). Standard air direction: form (A) configuration (Motor over Impeller).NI versions incorporate safety switch, stop/start. NI versions: fitted with ON/OFF isolation switch.Single phase 230V-50Hz motors (up to 1.5 kW). 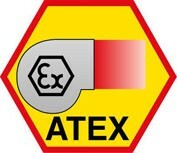 ATEX versionsOn request, explosion proof versions in accordance with ATEX Directive, for 3 phase models. 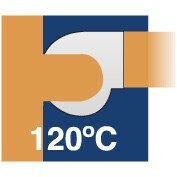 For ambient working temperatures from -20�C to +40�C. To select TTT-N ATEX refer to Easyvent.Note electrical data may vary for ATEX motors.Consult availability for other ATEX motor versions." 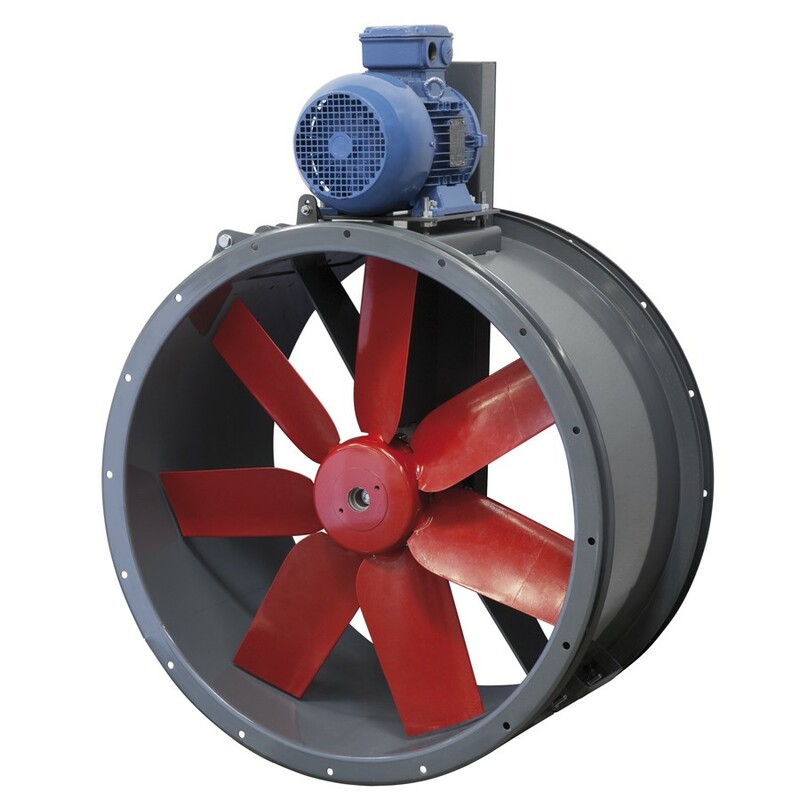 Swing-out fan casing assembly provides an easy access for cleaning or maintenance. Impellers are dynamically balanced, according to ISO 1940, providing vibration free operation and coated with a special low friction paint repelling the dirtiness. NI versions incorporate safety switch, stop / start.